Eyes closed, ears open! You can’t get to Africa faster than that. Audiobooks from kuduhear send the imagination on a journey, with documentary, music and readings. To prepare for your trip, refresh your holiday memories or simply for armchair-traveling. A lush green water world in the middle of a desert, untouched wilderness, unique wildlife and thousands of years of human history – Botswana is rich in natural and cultural treasures. Get your weekly bush-fix and enjoy a little journey to the African veld just about anywhere with this short episodes about wildlife, geology, history and suchlike. 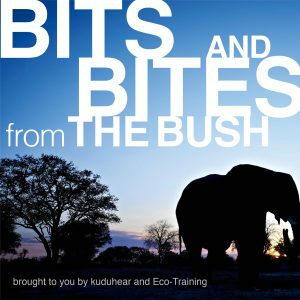 Bits and Bites from the Bush takes you onto audio-safaris guided by the instructors from Eco-Training. Tune in and learn more about topics like the art of tracking, the difference between brown and spotted hyena and why we are all made out of stardust. Do not miss any new episode – subscribe today and stay tuned. "There's a starman waiting in the sky He'd like to come and meet us But he thinks he'd blow our minds" The southern sky by night could be indeed mind blowing. In this last episode we reach for the stars… A Late Night Talk with Russel Crossey about astronomy and ancient beliefs. Birder or twitcher? No matter what. You will find birds on every safari, even if the big game plays hide and seek. Ross Hawkins introduces us to the world of feathered creatures and to the citizen based science and conservation program of the Southern African Bird Atlas Project. After their relocation in apartheid times, the Makuleke people started to claim back their land. The story of their success and what their future plans are is told by Eric, chairperson of the royal family of Makuleke. Nature conservation can't be regarded high enough, but sometimes it goes hand in hand with tragedy. In this episode, Norman, the chief of the Makuleke royal kraal, tells what happened to his village and makes the concession in northern Kruger possible. Lanner Gorge in the Pafuri region of South Africa got its name from the lanner falcon, which you could watch from the rim soaring on your eye level… But that's not the only sight. Looking down into the gorge, it seems the earth opens up as a history book. In this episode we have a chat with Ross Hawkins about geology and the breaking up of Gondwanaland. Don't trust Hollywood. Not only the movie "Lion King" portrays hyenas as ugly and mean creatures. In fact they are intelligent and co-operative with strong social bonds within their well-organised clans. Moreover With only four extant species, the Hyaenidae is the fifth-smallest biological family in the Carnivora, and one of the smallest in the class Mammali. Russel Crossey talks about the two most common species: The brown and the spottetd hyena. It is Africas largest and slowest antelope. Weighing up to 1,500 lb. and reaching 70 in. at the shoulder. But it is not the sheer size that makes the eland special. It's the role it has in the belief-system of the san, explains Russell Crossey. They are the tallest land mammals and their silhouette against a sunset sky is the empidome of Africa. But also in other respects giraffes literally stand out. For example, with their unique gait or their circulatory system, which prevents them from fainting, knows Lazarus Moalosi. They glow at night and their sting could sometimes be life-threatening. Ross Hawkins talks about scorpions and why it is crucial to look at the size of their pincers and tails. Even small things matter… In this episode, Ross Hawkins takes a closer look at the world of the creepy crawlies. At spiders to be precise. There are thousands and thousands and more thousands of zebras on the African plains. Grazing, galloping and doing their zebra-things. Some people think they are boring and there is not much more to see than a blur of black and white. Adrian Ntombo Kholi thinks otherwise. For a thrilling lesson in African history there is no need for old castles, ancient artifacts or interactive museums. Just sit down with Russell Crossey on a basalt ridge in Mashatu Game Reserve and he guides you through the centuries from the beginning of mankind to the present modern days. Volume two. For a thrilling lesson in African history there is no need for old castles, ancient artifacts or interactive museums. Just sit down with Russell Crossey on a basalt ridge in Mashatu Game Reserve and he guides you through the centuries from the beginning of mankind to the present modern days. Volume one. Where we all come from and where we all go to – Russell Crossey from Mashatu Game Reserve knows the answer. This episode is in essence about geology, but looks at it from a much wider perspective. Some see only a jumble of imprints on the ground. But other read it like a newspaper. Bruce Lawson talks about the centuries old art of deciphering tracks, spoors and signs of and in the wild. It is the world's fastest land mammal and can accelerate from 0 to 60 miles an hour in only three seconds. But there are many more fascinating facts about the cheetah than only speed. Today Nicola Jack shares her experiences with a coalition of cheetah-boys. Wind, sun, terrain… There is a lot you better get right when approaching game - not only on foot, but also in a vehicle. Bruce Lawson tells you about the basics for succesful viewings. Ich bin damit einverstanden, dass kuduhear meine Daten durch das Formular sammelt.